Cpl. Theodore Wolbach provides a number of descriptions of Memphis and the life and events experienced by the 16th Ohio and other troops during their 23 days encamped at Camp Oliver. These stories will be shared here on various days during this period. The officers of some of the new troops that were encamped near us neglected the good opportunity afforded here for drilling their men - but it was not in store for us to be neglected. A great part of our daily duty was company and battalion drill. DeCourcey seemed as anxious as ever to have us thoroughly disciplined. The volunteer and drafted recruits that had joined us were good material, and picked up the requisite knowledge readily when mixed (with) the old soldiers. A large force was concentrated here to be commanded by Major-General W. T. Sherman. In the organization of this army, the 16th regiment was in the Third Brigade, Third Division, commanded by Brigadier General George W. Morgan. Two new regiments, the 114th Ohio and 45th Indiana, were added to our brigade. A special inspection and review by General Sherman took place the first week in December. Sherman took particular pains to see every soldier. Dismounted, he passed close up to the ranks in front of every regiment, and looked sharply at the men, noting particularly if they were wearing anything else than the Government clothing. His sharp gray eyes were restless and his frame seemed nervous. The hard lines on his face gave him very much the appearance of an overworked business man. As he passed down our front, accompanied by General Morgan, the latter made some very complimentary remarks about our regiment. The closing ceremony of the occasion was the marching in review by the division. The 1st Wisconsin Battery in their daily drills with their twenty pounders, once in a while fired blank cartridges. One evening, when they were at this, a gun went off prematurely severely, scorching and otherwise hurting one of the gunners about the arms and face. We all greatly regretted this as we loved the members of that battery as we loved our own comrades. Fort Pickering, a large fortification on the river bank, was laid out by a practical military engineer. The work was not then complete, but pioneers were working at it every day. It was designed to have a deep ditch on the outside. Some buildings had been taken down to make room for the fort. When it was completed it was one of the strongest works on the Mississippi. Several times, when everything seemed favorable, DeCourcey marched us from the drill ground and conducted us through some of the principal streets of the city. These little trips were an enjoyment for all of us. They generally took place early in the evening, when the whole population seemed to be on the streets. Citizens, negroes, soldiers and rivermen formed one vast, motley, stirring crowd, that was interesting at this time of the day, when the noisy newsboys, with the fresh dailies, ran through the streets shouting the inducements to buy. One evening the little fellows ran close to our ranks, yelling 'Evening Bulletin; Fight in Arkansaw.' We were all eager to get the particulars of what was up in Arkansas. The papers told us that the Confederates had been met and defeated at Cane Hill and Prairie Grove. The names of the Generals Herron and Blunt, and the achievement of their little army, brought refreshing news to the loyal readers all over the country. The Federal cavalry, operating in the country back of Memphis, had a great many poor horses. The trooper with a broken-down animal was usually on the look out for something better. If they saw a good chance to get good horse, it was of little consequence to them if the owner was friend or foe. They got possession if they could. 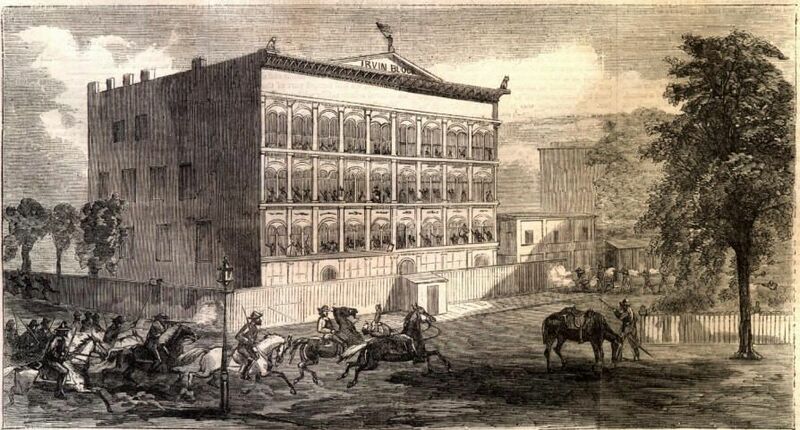 Four horses belonging respectively two to Brashear, one each to Chase and Matlock, of the 16th, disappeared one night. The supposition was that they did not leave the Union service. The Hamlet of Hopefield, on the Arkansas side of the river, opposite Memphis, was beginning to be an outlet for contraband goods smuggled from the city. The vigilance of the land and river forces did not succeed in suppressing it during the whole war. The ingenious methods practiced by rebel sympathizers to get valuable supplies through the Federal lines from Memphis, were sometimes novel and ludicrous, and not unfrequently irreverent. Quinine, morphine, revolvers, &c., were known to have been carried through to our enemies beneath the skirts of innocent looking ladies, and Sherman, in his Memoirs, mentions a coffin filled with valuable medicines conveyed in a hearse from the city to Vandorn's army. The frequent fires in Memphis, while so many troops were encamped around it, evidently became annoying to Gen. Sherman, who was often appealed to by citizens for an abatement of the trouble. It was plain enough that some of the Federal soldiers, encamped here were not entirely innocent of incendiarism, but it was also evident that buildings were fired by persons that were not solders. Sherman's policy was plain and sharp. When an offender was caught he was punished. By a few strokes of the pen he solved the most knotty technical questions and his letters on vexations matters, written during his command of the Memphis district, are curiosities of clear and quick decision today. It afterward became known to us that two heads of columns of the Federal forces were to point toward Vicksburg from the north; that of Gen. Sherman's on the river and Grant's, that was to move from Holly Springs through central Mississippi. Vast supplies were accumulated at Holly Springs for Grant's army. At this period of our service the 16th was in first class condition, splendidly drilled, and a small percent absent sick. The recruits that had recently joined us were excellent material, mainly robust, hardy looking fellows, and apparently capable of standing the hard knocks. There were exceptions among the drafted men. Some had been compelled to leave their families against their wishes, not being able to hire substitutes, as some of their more fortunate fellow men were. Thoughts of the grieved wife and children at home, and possibly a (distaste) for the military service, made them fretful, and made their reflections of the future gloomy. With all the discouraging features of their situation they performed their duties promptly and faithfully. Mentioned by Wolbach: Artists sketch of Irving Block Prison in Memphis, Tennessee. The former office building(s) was used by the Confederates as a hospital. After the fall of Memphis in June, 1862, the Union converted it to a prison to house Confederate sympathizers. The conditions at this prison were considered horrible, possibly the worst of any such prison during the war. The prison was ordered closed by Abraham Lincoln in 1864 and reverted to business offices after the war. 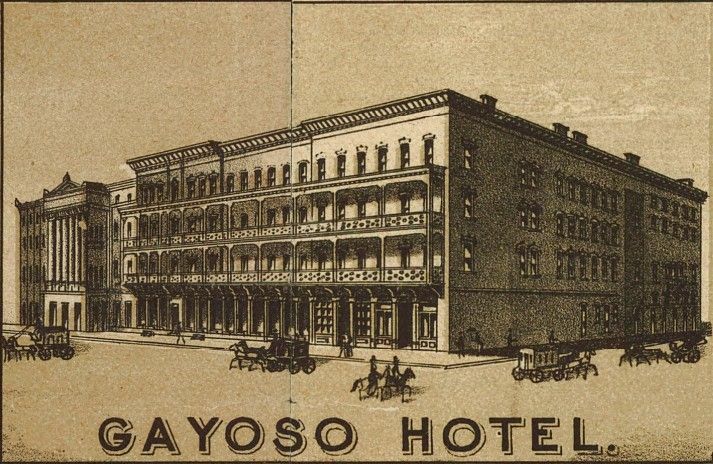 The building(s) was demolished in 1937. The image shown depicts a Confederate raid on Memphis and Irving Prison by General Nathan Forrest on August 21, 1864. The raid failed in its objectives but caused the Union to move troops from Mississippi to Memphis to better protect the city. Mentioned by Wolbach: The marble bust of Andrew Jackson, defaced by Confederates during the Civil War. 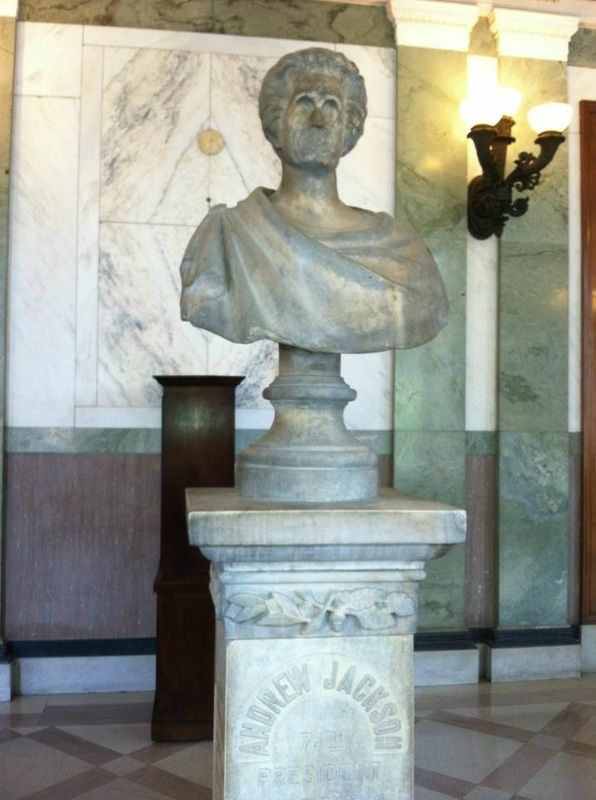 The bust now resides in the Shelby County Courthouse lobby in Memphis, Tennessee. 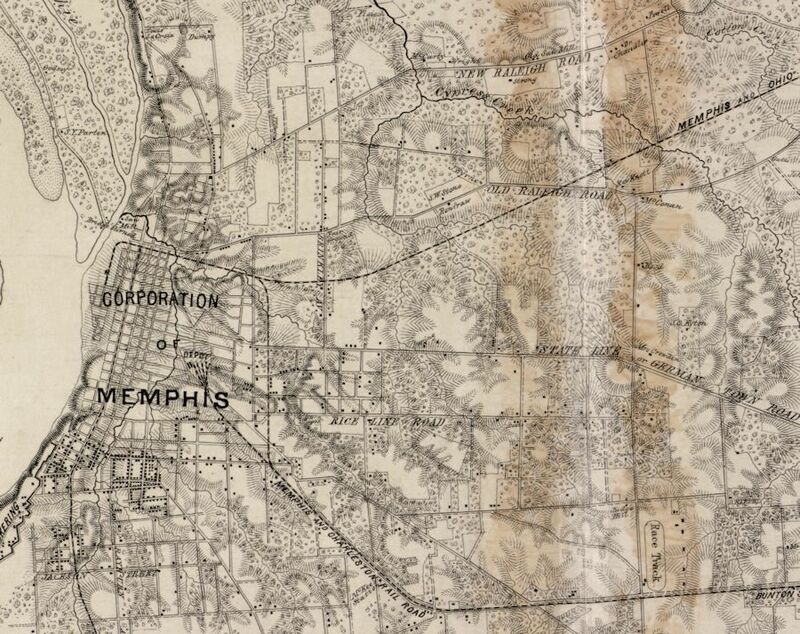 Excerpt from a Civil War era map of Memphis made for Gen. William T. Sherman - the racetrack can be seen in lower right which was the site of Camp Oliver; it is assumed the road State Line is actually Poplar Street further toward the city, on which the 16th Ohio marched from their steamboat landing on the Mississippi River to the camp.